Congratulations to last week's winner, Ashley of Breakfast at Saks. 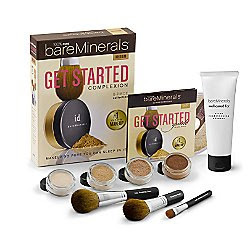 Bare Escentuals is giving away a free bareMinerals Get Started Kit every week here on Fashion Herald! Come back every Friday for another chance to win. Leave a comment, tell us what makeup base you use, and (ta-da!) you're automatically entered to win the Get Started Kit. Deadline is the following Monday at noon, when Kati and I will pick a winner in Fashion Herald's time-honored, low-tech name-drawing from the official wooden Fashion Herald name-drawing bowl. Don't forget to visit the Bare Escentuals boutique on 34th Street next time you're in the area! Squee! I basically dust on a little Physicians Formula powder and am done ... but would love the chance to try more mineral-based cosmetics. I do not use anything for makeup base yet, but i want to try with the BE kit. i'm currently not using anything, not sure what to use! i've tried some other mineral makeup before, but never bareminerals. currently i use a liquid foundation and a pressed powder- way too heavy. definitely would love to try this out, keeping my fingers crossed! I'm currently not using a base either but I would love to win this giveaway & try Bare Escentuals. I don't use base, but would love to start!! i dont use a makeup base yet, but i'd like to try this one out. JessicaCRB, you won but we haven't heard from you yet! Email (fashionherald@urbanmgt.com) or Tweet (@fashionherald) with a mailing address and shade preference so we can get your kit to you! What Size Am I Anyway?